Shredder breaks Baxter Stockman out of an asylum and puts him to work. April is at Channel 6 with Mr. Thompson as a news report featuring the Karate gang (disguised as turtles) rob another bank. Thompson is happy that there’s now proof that the TMNT are a menace. April calls Leonardo and tells him to meet her at the station. When the TMNT arrive, April plays them the tape of the bogus Turtles, and Leo surmises that Shredder is behind the deception. Just then, Thompson and his new girlfriend (who is turtlephobic) arrive. The girl spots the TMNT and goes into hysterics, so the Turtles flee out the window. Thompson demands to know why the Turtle terrorists were at his station, and April decides to take a new approach and tells her boss that she lured them there to expose them. Meanwhile, Splinter is home meditating when a huge, mechanized drill vehicle erupts into the sewer, piloted by Baxter. Stockman captures the Sensei and takes off, just as the Turtles get home. The TMNT follow the trail left by the huge contraption. When the Green Team gets to the end of the trail, they find the costumed Karate gang and a battle ensues. 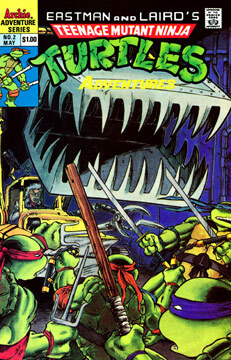 The Turtles win easily and find a message from Saki to meet at the Karate studio… if they dare! April decides to visit the Turtles and finds the tunnel made by the drilling machine, and investigates. The TMNT arrive at the karate studio just as Shredder is preparing to kill Master Splinter… but before the evil ninja can make his move, Baxter and his machine burst through the wall. The Turtles manage to get Baxter out of his vehicle and spoil Shredder’s plans in one fell swoop. Saki grabs Stockman and makes his getaway. April report on the news that evening reveals the whole story about the Karate gang and their hoax. Thompson’s girlfriend gets enraged that his station is defending turtles and dumps him.